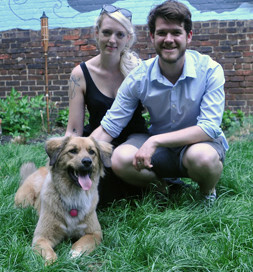 Lindsey and Mark had each grown up in a family with dogs, but now they were adopting one of their own and would be solely responsible for her. It was a little daunting, and they were nervous. But Lindsey had been rather obsessed with dogs for a while, and it was time to do something about it. Lindsey and Mark hang out with Birna. “She would send me about 10 pictures a day,” Mark says. But when they saw Luna, on Petfinder, something clicked, and the couple agreed she was the one. They applied to adopt her and provided the required references and details about their yard and home, including photos, to the rescue group before their application was approved. And then the day came to take her home. “She was totally the cutest dog,” Lindsey says. They marveled at how tiny she was and, after giving her a little time to stretch her legs, they started home. The couple had been to Norway a few months before adopting, a trip that influenced the name they gave their new puppy–Birna, “the little girl version of Bjorn, so it means something like little she-bear in old Norse,” according to Lindsey. Young Birna checks for cherry tomatoes. 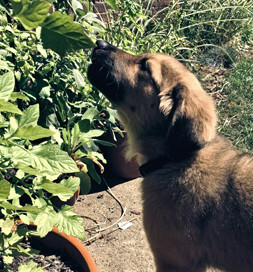 In her new backyard, Birna discovered lots of fun things, like cherry tomatoes. “Last summer,” Lindsey says, “her favorite habit was grabbing one ever so gently in her teeth, rolling it around on the ground until it popped, and then being so pleased that she’d found a treat. It was a sign of things to come for my plants.” But Lindsey takes it in stride, mentioning that chicken wire is perfect for protecting tomatoes and knowing that Birna is the perfect pet. Does Birna know how much Lindsey and Mark love her? Of course! They tell her every day.